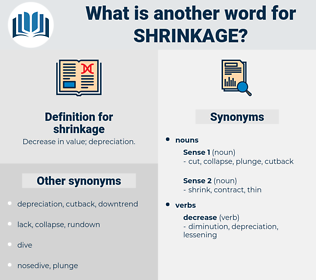 What is another word for shrinkage? 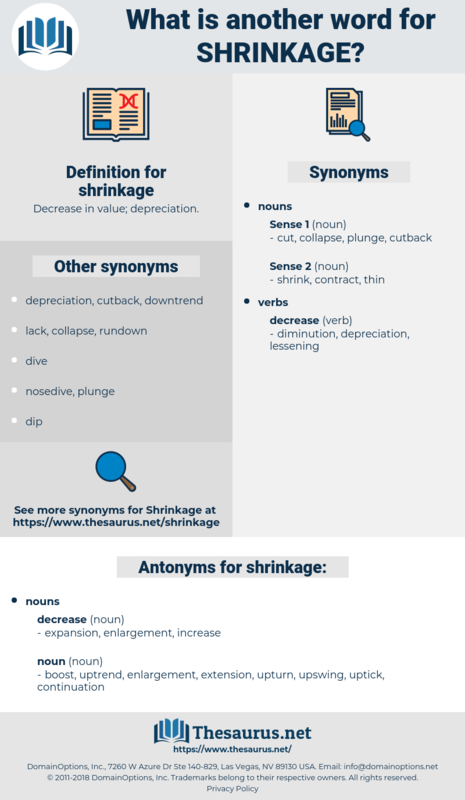 narrowing, shortening, decline, decrease, withdrawal, stricture, diminution, erosion, recession, deflation, downturn, curtailment, leakage, removal, retrenchment, drawdown, depletion, withdrawing, contracture, downsizing, drop, retreat, slowdown, loss, revocation, retraction, setback, slump, lessening, drain, delisting. continuation, extension, uptick, boost, uptrend, upturn, upswing. It seemed as if the bone in his nose was going, due to the shrinkage of the blood - vessels. It was now my turn to allow for shrinkage. sour mash, scrimmage, saccharomyces, s wrench, sourness, sharing, sour mash whiskey, squareness, sermonize, sereness, scrummage, skirmish, scrunch, Saccharum Munja, screw wrench, sour orange, syringe, souring, scaramouch, sorriness, shoring, scrounge, screwing, syrinx, shrunk, soaring, swaggering, scaramouche, scoring, sermonise, schizosaccharomyces, swearing, sureness, sure enough, screening, scranch, sugariness, surmise, shrink, serinus, syringa, scrawniness, serranus, Syringa Josikaea, screaming, sure-enough, sorrowing, squirming, shirring, Syringa Josikea, scouring, secureness, square inch, scraunch, soreness, sayornis, scrimshaw, scurrying, sarong, shrewmouse, shearing.